This is a fascinating document of the public debate on the Dixie School name change debate. It really gives you a flavor of the debate on both sides. It should be noted that the real issue was if the name "Dixie" is racist. None of my neighbors have any association with the South or the Confederacy but simply associate it with education excellence. After looking at the issue, I have concluded that it was an offensive to name the district "Dixie" in the midst of the Civil War in 1863 and we should find a new name for the future. 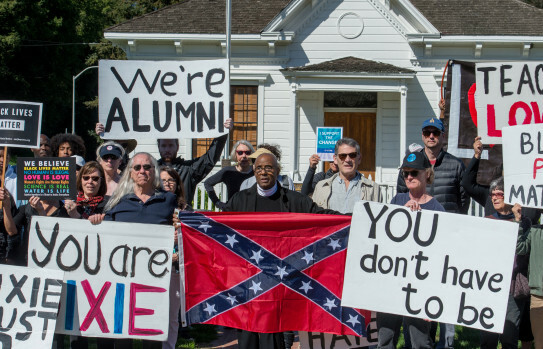 At no point do I think the "We are Dixie" group were racists and have been disappointed that the "Change the Name" people used bullying, intimidation and hyperbole to destroy the reputation of our community. The only time a Confederate Flag was flown in Marinwood is when Noah Griffin posed for this photo to send out to the news media. Marnie Glickman, could at one point be credited for raising the issue but ultimately condemned for allowing scorched earth tactics to effect change. Even after the issue was settled, she sought more media attention in the UK Guardian by trumpeting her "victory". We lost an important opportunity to learn about Marin County history from the Miwoks until the present day. We will heal and I hope this episode does not discourage minorities from choosing our wonderful community in fear that we are still a "Confederate outpost". Noah Griffin (left) is seen in his "Straight Outta Tiburon" tee shirt. Griffin is a wealthy political consultant who once worked for Speaker Nancy Pelosi has extensive media ties. The core strategy of the "Change the Name" people was to cast our community as racists in the international press until we succumbed to outside pressure. It worked but divided the community. Mark P. Mills and James B. Meigs join John Stossel to discuss the Green New Deal, the limits of wind and solar power, and the “magical thinking” of an all-renewable energy future. Countries around the world are embracing subsidies to expand the production of renewables, and environmentalists claim that we’re on the cusp of a tech-driven energy revolution that will make oil and gas obsolete. Are they right? Not likely. According to Meigs and Mills, improvements in wind and solar technology are reaching their theoretical limits. It would be virtually impossible to generate the amount of wind and solar power necessaryto replace the world’s oil and gas consumption. And yet, renewables enjoy strong political support, while nuclear technology, our best source of clean, reliable, and—yes—safe electricity, faces intense political opposition. Marnie Glickman, second from left, and Kerry Peirson, right, pose at the Dixie Schoolhouse. Photograph: Courtesy Marnie Glickman. 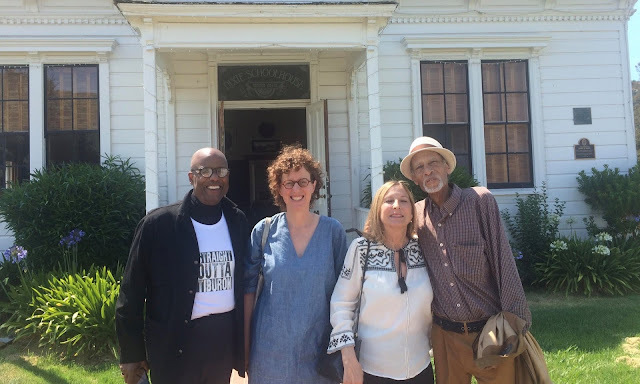 Noah Griffin, Marin IJ columnist and one time aide to Willie Brown and Speaker Pelosi is seen on the left wearing the “Straight Outa Tiburon” tee shirt. He is also seen below, dressed like a preacher, holding a Confederate flag. “It is supposed, by the ominous name, that the young ideas are here to be ‘trained how to shoot’ you,” wrote the Red Bluff Independent, in its 11 December edition. More than 150 years later, the Dixie school district board in northern California has voted to change the name, after a hard-fought, 22-year battle that shook this affluent community located thousands of miles from the former Confederate states. Against the backdrop of the national debate around Confederate monuments, the fight to change the district’s name turned particularly toxic, with racial slurs, accusations of antisemitism, a school board recall effort, and death threats. Concerns over a name that evokes slavery and racism should have been clear-cut in Marin County, which touts its liberalism and where more than 77% voted for Barack Obama in 2008. Dolly Parton dropped the “Dixie” in her civil war-themed theater production, Dixie Stampede, in 2018. Disney changed the name of its Antebellum-themed resort, Dixie Landings, in 2001. But at the heart of the matter in this county that is more than 85% white lies the interpretation of centuries-old documents, figures, and history itself – and, more importantly, the truths they tell about the community’s past. We Are Dixie, the group that formed to oppose the name change and put up lawn signs calling to “Keep Dixie Dixie”, felt that changing the name besmirched the legacy of James Miller, the man who founded the school district. “We believe James Miller was an amazing man, and they believe he was a racist who named the district after the Confederacy,” said a We Are Dixie representative who asked not to be named. Peirson contacted the superintendent at the time, who told him that Dixie was the name of the daughter of person who was superintendent in 1929. But the district and the old Dixie Schoolhouse had been named well before then – so Peirson began his own digging. In a 1972 application to the National Park Service to get the Dixie Schoolhouse added to the National Registry of Historic Places, the Dixie Schoolhouse Foundation cited Frances Miller Leitz, the granddaughter of James Miller, as saying that her grandfather had named the school itself on a dare. During construction of the school in 1864, Marin county “was hotly pro-Northern, and the fact that several ‘gentlemen’ from the South helped construct the first schoolhouse prompted someone to dare James Miller to name the school ‘Dixie’,” the application reads. This document doesn’t explain why James Miller chose to name the district Dixie in 1863, but in an oral history archived at the Marin County Library, James Miller’s great-great grandson, Lucien Miller, said James Miller was a Democrat. During the civil war era, southern Democrats favored slavery while the Republican party was the party of Abraham Lincoln. But opponents of the name change were doing research as well. They found a Miwok Native American woman named Mary Dixie, who lived 140 miles away in the Sierra Nevada foothills. Though James Miller sold cattle in the area where Mary Dixie lived in 1849, there is no record of the man ever meeting the woman they believe to be the school district’s namesake. Those behind We Are Dixie don’t believe that James Miller or his family had Confederate sympathies, and they argue that changing the name will only serve to minimize his contributions. For Glickman, the school board trustee who pushed for the name change, nothing better captured the crux of the whole fight than the fact that the opponents to the name change named their group We Are Dixie. She felt that they saw themselves as this name, as this place, as the founder, and that to call out the word’s Confederate and racist roots was akin to calling them racist. At the very least, the fight unearthed something ugly in Marin county, and not just from the civil war era. To Peirson, a black man living in a county that is not even 3% black, this was nothing new. When he first brought the issue to the board in 1997, he was the only black person in the room. And whether they choose to believe it or not, this mindset continues in Marin county to this day, Peirson said. The We Are Dixie group maintains that it was the Change The Name team that deployed bullying tactics. All sides hope to move forward from the nastiness and find a new name before the start of the next school year. A proposal to rename the school district after Mary Dixie, the Miwok woman who the We Are Dixie group believes the school district was originally named after, was rejected in an earlier effort. "Be quiet now," said an old Nurse to a child sitting on her lap. "If you make that noise again I will throw you to the Wolf." Now it chanced that a Wolf was passing close under the window as this was said. So he crouched down by the side of the house and waited. "I am in good luck to-day," thought he. "It is sure to cry soon, and a daintier morsel I haven't had for many a long day." 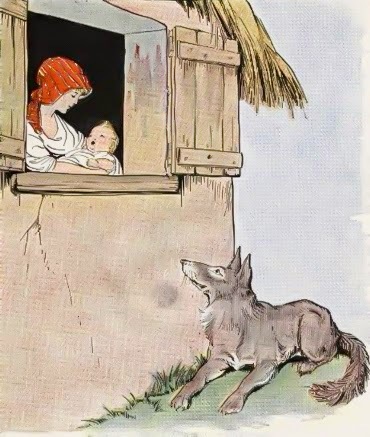 So he waited, and he waited, and he waited, till at last the child began to cry, and the Wolf came forward before the window, and looked up to the Nurse, wagging his tail. But all the Nurse did was to shut down the window and call for help, and the dogs of the house came rushing out. Moral of Aesops Fable: Enemies promises were made to be broken. California has the ninth-highest combined state and local sales taxes in the country, but its state sales tax of 7.3 percent is America's highest. As of April 1, California is now applying that high state sales tax to goods that residents buy online from out-of-state sellers. Such high taxes, often targeting a small percentage of the population, may have brought California a budget surplus of more than $20 million. Yet California is never satiated with high new tax rates that bring in additional revenue. It's always hungry for more. Scott Wiener, a Democratic state senator from San Francisco, has introduced a bill that would create a new California estate tax. Wiener outlined a death tax of 40 percent on estates worth more than $3.5 million for single Californians or more than $7 million for married couples. San Francisco ranks first among America's largest cities in property crimes per capita. The massive concrete ruins of the state's quarter-built and now either canceled or postponed multibillion-dollar high-speed rail system are already collecting graffiti. 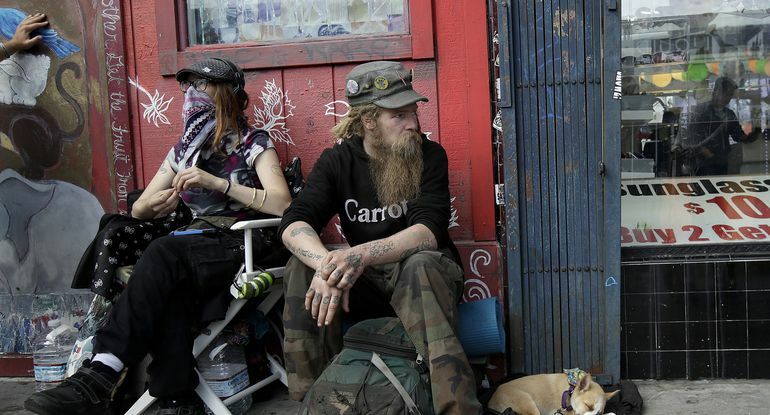 Roughly a quarter of the nation's homeless live in California. So do about one-third of all Americans on public assistance. Approximately one-fifth of the state's population lives below the poverty line. About one-third of Californians are enrolled in Medi-Cal, the state's health care program for low-income residents. California's social programs are magnets that draw in the indigent from all over the world, who arrive in search of generous health, education, legal, nutritional and housing subsidies. Some 27 percent of the state's residents were not born in the United States. A lot of upper-middle-class taxpayers feel that not only does California fail to appreciate their contributions, but that the state often blames them for not paying even more -- as if paying about half of their incomes to local, state and federal governments somehow reveals their greed. The hyper-wealthy liberal denizens of Hollywood, Silicon Valley and the coastal enclaves often seem exempt from the consequences of the high taxes they so often advocate for others. The super-rich either have the clout to hire experts to help them avoid such taxes, or they simply have so much money that they are not much affected by even California's high taxes. Venezuela, which is driving out its middle class, is apparently California's model. Venezuelan leaders believed in providing vast subsidies for the poor. The country's super-rich are often crony capitalists who can avoid high taxes. Those who administer California's plagued department of motor vehicles and high-speed rail authority may often be inept and dysfunctional, but the state's tax collectors are the most obsessive bureaucrats in the nation. What is Sacramento's message to those who combine to pay half the state's income taxes and have not yet left California? "Be gone or we will eat you!" Victor Davis Hanson is a classicist and historian at the Hoover Institution, Stanford University, and the author of the soon-to-be-released "The Second World Wars: How the First Global Conflict Was Fought and Won," to appear in October from Basic Books. You can reach him by e-mailing authorvdh@gmail.com. The proposed Marinwood Maintenance Compound won't have a grassy area in front. This area must be used for loading/unloading of landscape materials. 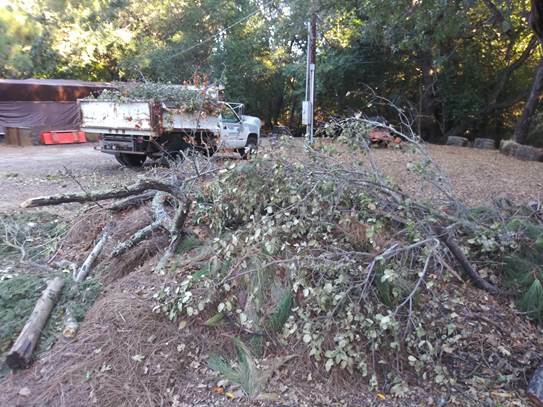 The Marinwood CSD maintenance crew generates big piles of landscaping debris and trash each week. They store this in the large open area next to the horse shoe pits in Marinwood Park to allow the convenient loading/dumping of material. A bucket loading operation requires much space as you can see in this video. Generally, the dump trailer is loaded from the side into the center of the trailer. The operator must do this to balance the load for safety. This means the bucket loader requires a large area for scooping material and turning. The truck and trailer must be parked perpendicular to the bucket loader. In the site plan of the proposed Maintenance Facility below, you can see that the only area where this operation can take place is IN FRONT of the Maintenance Facility. The architect has drawn a walking path in this area to deceive the planning department. There is NO ROOM inside the walled maintenance compound to perform a mechanized loading operation. Our Ford F250 is 22 feet long.and the dump trailer is approximately 20 feet long including tongue. This means that 42 feet of space will be required for the truck/trailer and an additional 40' to 60' feet to the side will be required for the bucket loader and material. This will occupy all the area between the maintenance building and Miller Creek. 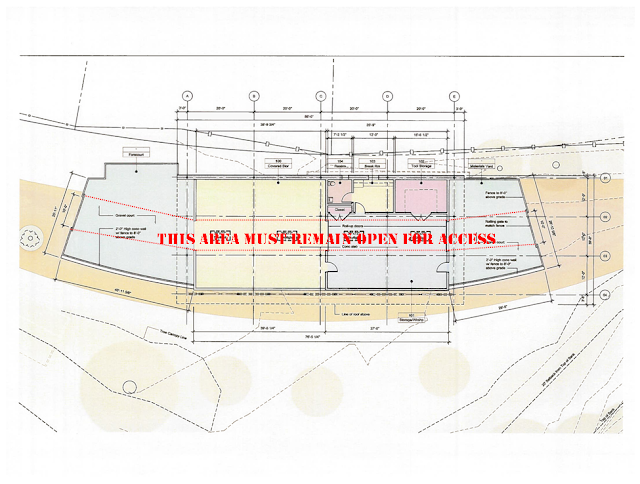 This drawing shows the footprint of the proposed Maintenance Bldg and the old building footprint in brown. The brown box on the left is the area the architect calls open storage. In fact the entire area from the current building to the horse shoe pit is used for landscaping debris, parking and tool storage. 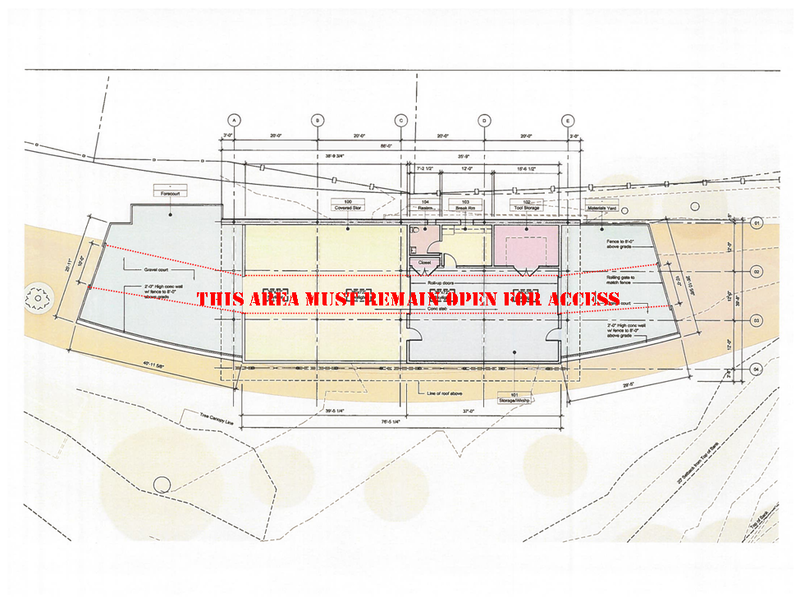 Clearly there is no area suitable for loading and unloading material within the proposed Maintenance Building above. The architect shows this area as green space and a walking path but it will not happen. It will be used for parking and storage of debris and landscaping materials. The is no alternative. What happened to the access road that the architect showed in previous drawings? It has disappeared. This is highly deceptive. The architect must show where essential activities will take place on the building site. Safety vehicles and pedestrians must pass through this area. The drawings do not show the true impact to the stream conservation area and Marinwood Park. The proposed Marinwood CSD Maintenance Facility is simply too big and inefficient, harms the environment and occupies land that should be used for recreational purposes as intended. The Marinwood "Drive Through" Maintenance Facility now before the Marin County Planning board is completely unworkable for the maintenance department and our service vehicles. The video below shows why. Our maintenance department has a 2018 Ford F250 truck that is 22 feet long and a 16' dump trailer. Just like the truck in the short video, our F250 needs 51.9 feet to turn around . This means that our truck will be on the edge of Miller Creek stream bank every time it needs to turn around, rain or shine. More likely it will drive to the meadow to turn around and destroy this lovely area too. In 2007, a catastrophic flood destroyed the stream bank below the current maintenance facility to prevent it from being lost. If you look at the eastern edge of the maintenance shed, you will see the edge of the stream bank. While the proposed maintenance facility is further away from the current garage area, it is still far too close to the stream bank where flooding occurs. It is COMPLETELY within the restricted area under the 2007 Stream Conservation Ordinance. This would be bad news for the CSD but fortunately, Irv Schwartz, noted Marin Civil Engineer and former CSD Director came up with the best solution in 2017 called "Option 3". It is a conventional maintenance facility design that is long and narrow and is situated next to the fence line. It is the same size as the McInnis Park facility or about ONE THIRD the size and cost of the proposed Marinwood Park facility. Option #3 is the "environmentally preferred" option for our next maintenance facility. Tell the Marinwood CSD/ Marin County to stop wasting money on a maintenance compound that will destroy our park. Design a new facility based on Option Three.